Thursday 29th June 2017 – 10.50am – Claire Brown. Would you like to help save lives in your local community in your spare time? We’re looking for keen and willing potential recruits to become volunteer Community First Responders (CFRs) in Shropshire. CFRs are members of the public from all walks of life who give up their spare time to help make a difference in their communities. Trained by West Midlands Ambulance Service to a nationally recognised level, CFRs will learn basic life support and how to use a defibrillator as well as how to deal with a range of medical and traumatic emergencies. CFRs then spend time training alongside ambulance staff before going ‘live’. When CFRs book on for their voluntary shift, the Trust’s control room will respond them to medical emergencies in their local community while an ambulance is en-route. CFRs are vital in life-threatening situations, particularly in the case of a cardiac arrest, when every minute really does count. To volunteer, you must be aged 18 or over and have a full driving licence. West Midlands Ambulance Service will help you obtain the necessary equipment and no previous experience is necessary as full training is provided. To find out more and to apply for this exciting voluntary lifesaving role, please visit NHS Jobs via www.jobs.nhs.uk and search for ‘Community First Responder’. The closing date for applications is Thursday 6th July. Thursday 29th June 2017 – 9am – Jamie Arrowsmith. A man is in a critical condition after suffering serious injuries in a collision with a lorry on the M6 in the early hours of this morning. West Midlands Ambulance Service was called to the southbound carriageway, between junctions 16 and 15, shortly after 4.20am and sent two ambulances, a paramedic officer and a BASICS doctor to the scene. A West Midlands Ambulance Service spokesman said: “Crews arrived to find the patient, a man believed to be in his 20s, lying on the hard shoulder following the collision. “He had suffered multiple serious injuries and was suffering from a reduced level of consciousness. The man received specialist trauma care at the scene before being anaesthetised in order to stabilise his condition. Wednesday 28th June 2017 – 10.00am – Claire Brown. Sometimes there is simply nothing our ambulance staff can do to save a life, which was the case following a collision in Leamington Spa in the early hours of this morning. West Midlands Ambulance Service was called to reports of a collision involving a car and a pedestrian near to the railway station on Old Warwick Road, Leamington Spa just after midnight (Wednesday). Two ambulances and a paramedic officer attended the scene. Tuesday 27th June 2017 – 8.45am – Claire Brown. A man received major trauma care at the roadside by ambulance staff last night following a road traffic collision. West Midlands Ambulance Service was called to reports of a motorcyclist who had collided with a lamppost at the junction of Queens Road and Roanne Ringway in Nuneaton, Warwickshire just before 11.50pm (Monday). An ambulance, a community paramedic, a paramedic officer and a critical care car from The Air Ambulance Service attended. A West Midlands Ambulance Service spokeswoman said: “When ambulance staff arrived they found a motorcyclist on the floor. Upon assessment the motorcyclist, a man believed to be in his 20s, was in a critical condition and had sustained significant injuries to his leg which required immediate advanced trauma care. Monday 26th June 2017 – 6.00pm – Murray MacGregor. They may not be quite as rapid as a blue light ambulance, but they certainly proved useful in helping an ambulance crew earlier. What are we talking about? Canal narrow boats. 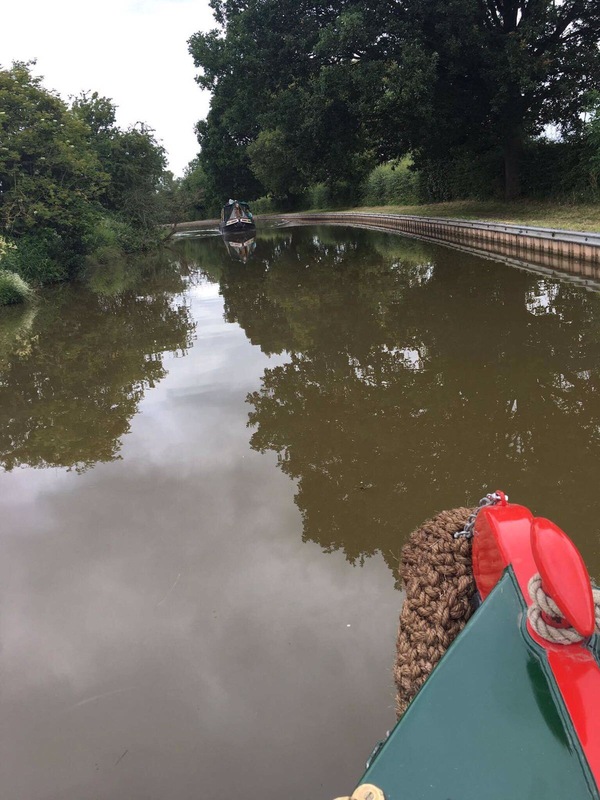 West Midlands Ambulance Service was called to a location about half a mile from Bridge 82 on the Coventry Canal in the Huddlesford area near Lichfield at about 9.40am this morning to reports that the man piloting a narrow boat had collapsed. Other canal users had managed to get onto the boat and bring it to a halt at the canal side. Paramedic Chris Tuncliffe and Technician Simon Poole were sent to the scene. Chris said: “We got the ambulance to as close to the location as we could but we still had to walk for about half a mile to the narrow boat where we found the patient, a 68-year-old man, who had by this point come round. Simon said: “I was about to start walking when I managed to catch a lift on another boat that was heading in that direction and got a lift back to the ambulance. Chris added: “Our patient had low blood pressure and some other existing conditions which meant he needed to go to hospital so going by boat was definitely the easiest way to move him. The patient was taken to Burton Queens Hospital for further assessment. Monday 26th June 2017 – 8.40am – Murray MacGregor. Two men have been injured, one seriously, after a car collided with the rear of a lorry on a busy motorway leaving them trapped for over an hour. It happened on the southbound M6 just where the slip road leaves for the M1 at about 1.40am on Monday morning. Two ambulances, a paramedic area support officer, The Air Ambulance Service critical care car and the MERIT Trauma doctor were sent to the scene from West Midlands Ambulance Service along with resources from East Midlands Ambulance Service. A West Midlands Ambulance Service spokesman said: “The small car had become trapped under the rear of the HGV. “Ambulance staff worked with firefighters to pull the vehicle clear and provided treatment while the men, who were estimated to be in their 30’s were cut free from the wreckage. In total they were trapped for about 70 minutes. “The front seat passenger had suffered multiple injuries and was anaesthetised at the scene before being taken by ambulance on blue lights to the Major Trauma Centre at University Hospital Coventry & Warwickshire. “The driver had suffered much less serious injuries and was dealt with by East Midlands Ambulance Service. Friday 23rd June 2017 – 9.10am – Jamie Arrowsmith. A man has been airlifted to hospital after being left trapped in his car for about 30 minutes following a two-vehicle RTC yesterday afternoon. West Midlands Ambulance Service was called to the junction of Leys Road and Evesham Road in Harvington, Evesham, shortly after 5.35pm and sent two ambulances, a rapid response paramedic, a paramedic officer and the Midlands Air Ambulance from Strensham to the scene. A West Midlands Ambulance Service spokesman said: “Crews arrived to find a car lying on the driver’s side and in a ditch. “There were two patients from that car. The driver, a man in his 80s, was trapped as a result of the damage suffered to the car and ambulance staff worked closely with the fire service to free him through the passenger door. “He was assessed throughout the extrication and treated for injuries to his head, face, arm and back. The man, who was suffering from a slightly reduced level of consciousness, was immobilised, given pain relief and carefully moved on to the air ambulance before being flown to Queen Elizabeth Hospital, Birmingham. “The passenger in the car, a woman in her 80s, had been assisted out prior to the arrival of ambulance crews and was lying on the ground. “She was fully conscious and treated for a minor abdominal injury before being transported to the Alexandra Hospital in Redditch. Thursday 22nd June 2017 – 6.00pm – Claire Brown. A girl has sadly died in a road traffic collision after the car she was travelling in collided with a fence this afternoon in Warwickshire. West Midlands Ambulance Service was called to the B4114 Smockington Lane in Wolvey, Hinkley just after 2.00pm (Thursday). An ambulance, a paramedic officer and the Warwickshire and Northamptonshire Air Ambulance with a doctor on board attended the scene. East Midlands Ambulance Service were also responded. Wednesday 21st June 2017 – 9.45am – Murray MacGregor. Ambulance bosses are urging caution after an incident in which five teenagers got into difficulty whilst swimming in a river. West Midlands Ambulance Service was called to a location near Ross Rowing Club on Rope Walk, Ross-on-Wye at just after 7.30pm on Tuesday night to reports of a drowning. An ambulance, a paramedic officer and a rapid response vehicle were sent to the scene. A West Midlands Ambulance Service spokesman said: “Ambulance staff were told that the teens had got into difficulty in the River Wye. “Two members of Ross Rowing Club went into the water, while others used a rowing boat to get to the youngsters. In the meantime, one of the clubs rescue launches was also launched. “Three of the girls were able to get out of the water themselves. A 17 year old girl was rescued from the side by the launch and a 15 year old was rescued from the water by the rowing boat. “The 15-year-old girl was shaken by her ordeal but was uninjured and discharged with advice. “The 17-year-old was assessed at the scene and taken to Hereford County Hospital by ambulance as a precaution. Wednesday 21st June 2017 – 9.20am – Jamie Arrowsmith. Seven people were injured, one of whom was airlifted to hospital, following a crash between a lorry and a minibus on the M6 yesterday afternoon which caused the motorway to be closed in both directions. West Midlands Ambulance Service was called to the southbound carriageway, between junctions 3 and 2, shortly after 5.05pm and sent two ambulances, a paramedic officer and the Warwickshire and Northamptonshire Air Ambulance to the scene. A West Midlands Ambulance Service spokesman said: “Crews arrived on scene to find a minibus with front end damage and a lorry with rear end damage. All eight occupants of the minibus were out of the vehicle and standing at the roadside. “The most seriously injured patient was a 37-year-old man with a suspected fractured leg. He received treatment from ambulance staff before being carefully moved to the air ambulance, which had landed on the motorway, and flown to University Hospital Coventry and Warwickshire. “There were six more patients with minor injuries, all of whom were men. They were treated for knee, shoulder, leg, hand, arm and neck injuries before being transported to the same hospital by the two land ambulances. Wednesday 21st June 2017 – 8.47am – Murray MacGregor. A cyclist has been airlifted to hospital with serious head injuries after a freak accident whilst out riding in a large peloton of riders. It happened on the Kings Bromley to Alrewas road in Staffordshire at around 6.20pm on Tuesday night. An ambulance, a paramedic officer and the Midlands Air Ambulance from Staffordshire were sent to the scene. The rider, who was in his 30s was in a in of about 50 riders travelling at about 25 miles an hour when he came together with another cyclist and it was reported that he went over his handlebars and landed on his head. The man was unconscious with a serious injury. The doctor on board the aircraft decided to anaesthetise the patient at the scene before he was flown to the major trauma centre at Royal Stoke University Hospital. Tuesday 20th June 2017 – 9.15pm – Murray MacGregor. A teenager has died after an incident at a lake in the Pelsall area of the Black Country. West Midlands Ambulance Service was called along with West Midlands Fire and Police colleagues to the lake beyond Ryders Hayes Lane at 6.50pm this evening (Tuesday) to reports that a boy had gone into the water and not resurfaced. An ambulance, a paramedic officer, the Hazardous Area Response Team who have a water rescue capability, the Midlands Air Ambulance from Strensham and the MERIT trauma doctor were sent to the scene. A West Midlands Ambulance Service spokesman said: “While staff on the ground searched the area, both the air ambulance and a police helicopter searched the lake from the air. “Tragically, the boy was later recovered from the water and was confirmed dead at the scene. With the hot weather set to continue for a day or two yet, it’s vital that everyone looks after themselves and their loved ones to ensure they stay healthy in the heat. Very often it’s simple things that help make life more bearable when it is hot and humid. Tuesday 20th June 2017 – 5.15pm – Jamie Arrowsmith. A young boy is in a critical condition following a road traffic collision with a car this afternoon. West Midlands Ambulance Service was called to Newcastle Road in Madeley, near to Madeley High School, just after 3.35pm and sent two ambulances, a paramedic officer, two BASICS doctors and the Midlands Air Ambulance from Cosford to the scene. A West Midlands Ambulance Service spokesman said: “Crews arrived to find an 11-year-old boy who had suffered serious injuries in the collision. “He received specialist trauma care at the scene before being airlifted to Birmingham Children’s Hospital. The hospital had been alerted to the boy’s condition prior to arrival. Are you looking after yourself and your loved ones in the hot weather? Tuesday 20th June 2017 – 10.45am – Murray MacGregor. Ambulance bosses are urging the public to look after themselves and their loved ones as the hot and humid weather looks set to continue for a few days yet. It comes after call numbers for those suffering from heat related issues rose significantly in the last few days. The heat is particularly affecting older people (especially those over 75); babies and young children, people with a serious chronic condition; especially heart or breathing problems; and people with mobility problems such as people with Parkinson’s disease or who have had a stroke. Assistant Chief Ambulance Officer, Michelle Brotherton, said: “We are seeing lots of cases of patients becoming dehydrated after not having drunk enough water. There are also cases of people who are simply overheating which is a particular problem if the individual already has problems with their heart or breathing. Particularly over the weekend we also saw cases of heat exhaustion and heatstroke for people who were out in the sun for many hours who had not taken precautions. “Thank you to our staff who are working incredibly hard to deal with the increased demand whilst also having to cope themselves in the high temperatures. Friday 16th June 2017 – 4.00pm – Claire Brown. A road traffic collision in North Warwickshire this afternoon has sadly claimed the life of a motorcyclist. The ambulance service received a 999 call to reports of a collision involving a motorcyclist and a van on Coleshill Industrial Estate, Station Road in Coleshill at around 12.30pm today (Friday). An ambulance, a paramedic officer and the Warwickshire and Northamptonshire Air Ambulance with a doctor on board were sent to the scene. A West Midlands Ambulance Service spokeswoman said: “The paramedic officer arrived first on scene to find police performing CPR on a motorcyclist, a man, who was in cardiac arrest. “The team of ambulance staff quickly took over resuscitation efforts, administering advanced trauma care to try to save the man’s life. Sadly, despite their best efforts on scene, the man was confirmed dead a short time later. Friday 16th June 2017 – 10.50am – Murray MacGregor. A family of seven have been treated for smoke inhalation after a fire at their house. West Midlands Ambulance Service was called to the property in Keeley Street in the Bordesley Green area of Birmingham at about 7.50am this morning. Three ambulances and a paramedic officer were sent to the scene. A West Midlands Ambulance Service spokesman said: “On arrival, all seven family members were outside the property. The building itself had been badly affected by the fire. “The 53-year-old father was worst affected after getting his family out of the property. He was treated for smoke inhalation as was his 34-year-old wife. There were five children, girls of 15, 8 and about 5 years as well as a baby boy and a toddler boy; they too were treated for the effects of smoke inhalation. Friday 16th June 2017 – 9.25am – Claire Brown. Despite the best efforts of ambulance staff and hospital medics, a young girl has sadly died following a collision in Shrewsbury yesterday afternoon. West Midlands Ambulance Service received a 999 call at 4.18pm on Thursday afternoon to reports of a collision involving a pedestrian and a 4×4 on Mytton Oak Road in Shrewsbury. The first ambulance was on scene within two minutes of the 999 call, quickly followed by a paramedic officer, a second ambulance and the Midlands Air Ambulance from Cosford with a MERIT trauma doctor on board. A West Midlands Ambulance Service spokeswoman said: “Emergency services arrived to find a young girl, in cardiac arrest after being involved in a collision with a 4×4. Ambulance staff immediately commenced life support on the girl at the scene. 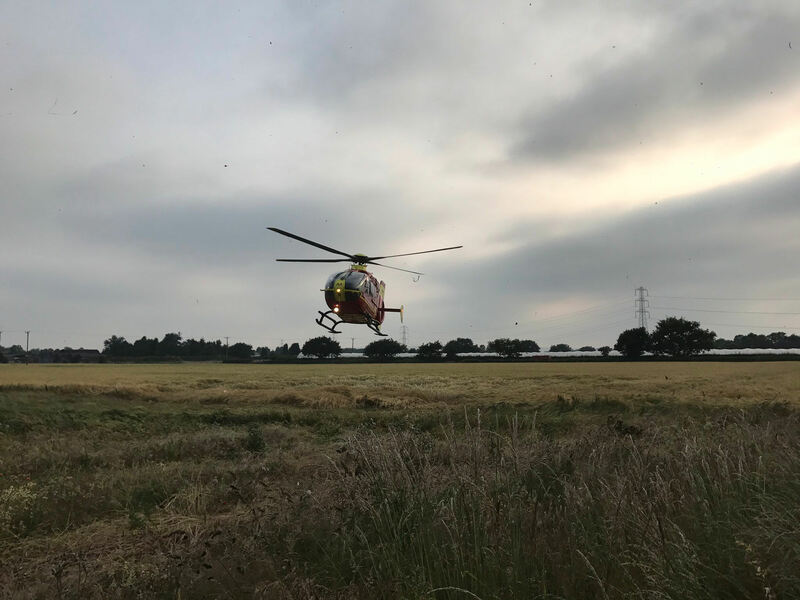 “Due to the proximity of Royal Shrewsbury Hospital, the team took the decision to rapidly convey her by land ambulance on blue lights to the nearby A&E whilst resuscitation efforts continued en-route. “Tragically, despite further treatment in hospital, nothing could be done to save the girl and she has since died. Thursday 15th June 2017 – 12.45pm – Murray MacGregor. A cyclist has died after he was involved in an incident involving a van and a car. It happened at about 7.40am this morning on Bromsgrove Road, Romsley, to the south of Halesowen. A paramedic officer was on scene in 8 minutes and was backed up by an ambulance and the Midlands Air Ambulance from Cosford. A West Midlands Ambulance Service spokesman said: “The middle aged cyclist had suffered significant injuries in the crash. “He received considerable treatment from the ambulance staff and air ambulance doctor but sadly, despite the extensive efforts it wasn’t possible to save him and he was confirmed dead at the scene. Thursday 15th June 2017 – 9.28am – Murray MacGregor. A cyclist has been anaesthetised at the scene of a crash with a van. It happened at about 6.30pm on Wednesday evening at the junction of Bridge Street and New Street in Kenilworth. Two ambulances and a paramedic officer were sent to the scene along with the Warwickshire and Northamptonshire Air Ambulance, which landed in a nearby park. A West Midlands Ambulance Service spokesman said: “Initial calls suggested that the cyclist had been left unconscious in the middle of the road after the collision. “Ambulance staff arrived on scene 6 minutes after the 999 call and found the middle aged man in a semi-conscious state. “The man, who was not wearing a cycle helmet, was suffering from potentially serious head and facial injuries. “Given his condition, the doctor decided to anaesthetise him at the scene before he was taken on blue lights by land ambulance to the major trauma centre at University Hospital Coventry & Warwickshire; the doctor travelled with the ambulance crew. Thursday 15th June 2017 – 8.54am – Murray MacGregor. A crash that left the engine of a car 20 metres away from the rest of the vehicle and a lorry on its side, has resulted in two men being injured, with one airlifted. The crash happened on Long Lane on the road from Bronington to Whitchurch on the Shropshire / Welsh border at about 6.50pm on Wednesday night. Two ambulances, one from WMAS and the other from Wales were sent to the scene along with the Midlands Air Ambulance from Staffordshire. A West Midlands Ambulance Service spokesman said: “On arrival, ambulance staff found a car that had suffered very significant front offside damage. Part of the engine was lying about 20 metres away. Further up the road there was an HGV on its side. “The car driver, a man in his 20s was the most seriously hurt. He was trapped for around 50 minutes while firefighters worked with ambulance staff to extricate him while he received treatment. “He had suffered a broken right leg and fracture dislocation of his ankle. He was given pain relief and was immobilised before being airlifted to the major trauma centre at Royal Stoke University Hospital. “The front seat passenger, a man also in his 20s, had managed to get out of the vehicle himself and was treated for abdominal pain and seat belt injuries. He was taken by the Welsh ambulance to Royal Shrewsbury Hospital. Wednesday 14th June 2017 – 11.00am – Claire Brown. A woman whose car ended up on its roof in Telford this morning has been airlifted to hospital after suffering a serious arm injury. The single car collision happened on Lincoln Hill in Ironbridge, Telford, shortly before 8.15am (Wednesday) and an ambulance, a paramedic officer and the Midlands Air Ambulance from Cosford with a MERIT trauma doctor on board attended the scene. A West Midlands Ambulance Service spokeswoman said: “When ambulance staff arrived they found a car which had rolled off a single-track road and landed on its roof. The driver and single occupant, a woman in her 30s, had managed to get out of the vehicle and was sitting at the side of the road being cared for by passers-by. Wednesday 14th June 2017 – 9.15am – Claire Brown. A man was airlifted to a major trauma centre last night after he was involved in a road traffic collision. West Midlands Ambulance Service was called to the junction of Crooked Bridge Road and Prospect Road in Stafford at around 4.50pm yesterday (Tuesday). An ambulance, a paramedic officer and the Midlands Air Ambulances from Cosford and Tatenhill attended; one had a MERIT trauma doctor on board. A West Midlands Ambulance Service spokeswoman said: “The emergency services arrived to find a cyclist and a car which had been in a collision. The cyclist, a man, was initially trapped underneath the car and, once freed, ambulance staff were able to fully assess his condition. The man had suffered multiple injuries which required advanced trauma care by the doctor and ambulance staff at the roadside. Tuesday 13th June 2017 – 11.30am – Claire Brown. Scaling Mount Snowdon once is enough for most people but two paramedics from Birmingham are preparing to walk up (and down) Snowdon seven times in seven days for charity. Paramedics Amanda Hill and Kay Alexander, based at the Trust’s Hollymoor hub in Rubery, will be walking up Mount Snowdon in Wales via the Llanberis route for seven consecutive days from Friday 7th July with their final ascent planned on Thursday 13th July. The duo, who decided on the charity walk whilst at the top of Snowdon last year, are hoping to raise £1,500 each for two charities close to their hearts. A close friend of Amanda’s has Neuroendocrine Tumours (NET), a currently incurable cancer, and is raising money for Queen Elizabeth Hospital Birmingham who are funding NET research. Kay’s little boy Alex was born with a critical heart condition and is raising money for Birmingham Children’s Hospital where Alex received life-saving treatment. (pictured Kay (left) and Amanda (right) at the top of Snowdon last year). Monday 12th June 2017 – 4.25pm – Jamie Arrowsmith. Ambulance staff in North Staffordshire have welcomed the opening of their new base, which replaces the previous one that had been open for 55 years. The new site in Etruria, Stoke, replaces the Broomhall Centre in Hilton Road. The move took place on May 25th. At 19,000 square feet, it is the biggest ambulance hub in the West Midlands and will be the operating base for around 250 staff and more than 50 ambulances. Senior Operations Manager, Mark Chapman, said: “This new facility is a state of the art centre which will ensure West Midlands Ambulance Service can continue to provide one of the best ambulance services in the country. “It is a far cry from the previous site which was far too small and no longer fit for purpose. “The hub is much bigger than the previous site and has been designed to provide a much more pleasant working environment for our staff. “Using the latest design and technology it will reduce our running costs which means we can put more money into frontline care. The location gives us excellent access through the area and it combines fantastic facilities for staff. Operations Manager Becky Hughes reflects on how the new hub has improved the way the Trust operates in Stoke. Staff are united in giving the new facility the thumbs up. One of the biggest improvements available to staff is the provision of much improved IT, such as a dedicated computer room and a virtual learning area. The new hub brings a wide range of improvements for staff and patients alike. A man has suffered serious injuries after being involved in a road traffic collision with a car in Walsall this afternoon. West Midlands Ambulance Service was called shortly after 2.30pm today to Bentley Road North, Bentley after reports of an RTC involving a pedestrian. An ambulance, a paramedic officer and the Midlands Air Ambulance with a MERIT trauma doctor on board were sent to the scene. Tuesday 6th June 2017 – 10am – Jamie Arrowsmith. A car driver had an incredibly fortunate escape yesterday when walking away relatively unharmed after a tree branch smashed through his windscreen whilst driving. The incident happened on School Lane in Exhall, Coventry, shortly before 3.30pm and West Midlands Ambulance Service sent an ambulance and a paramedic officer to the scene. A West Midlands Ambulance Service spokesman said: “The driver of the car, a man in his 40s, has been extremely fortunate to escape serious injury as had the branch fallen just a few feet further away, we could have been talking about a very different story. “As it is, the man managed to get himself out of the car and after he was assessed for a minor hand injury he was discharged at the scene. Monday 5th June 2016 – 4.20pm – Claire Brown. Not one but two community first responder (CFR) groups in the West Midlands have received the most prestigious award a voluntary organisation can get. FastAid Black Country CFRs and Eccleshall CFRs have been recognised with the Queen’s Award for Voluntary Service for 2017 for providing emergency medical aid, training and lifesaving equipment to those living and working in their local community. For more information about the groups, to make a donation or find out more about joining them, please go to: http://www.eccleshallcfrs.org.uk/ and www.fastaidblackcountry.org.uk/. Pictured: 1 – FastAid Black Country CFRs Carol Waite and Ian Waite at Buckingham Palace last week. 2 – Eccleshall CFR Group Coordinator Martin Watson next to the schemes car. Thursday 1st June 2017 – 3.00pm – Murray MacGregor. Today marks the start of a week where we celebrate the amazing work that our volunteers do, day in, day out, to support West Midlands Ambulance Service and the public at large. Literally hundreds of people support the Trust on a daily basis so it is only right and proper that we pay tribute to them during Volunteers Week, which runs from the 1st to 7th June. Trust Chief Executive, Anthony Marsh, said: “Whether you are a BASICS Emergency Doctor, a community first responder, someone who trains people in CPR, a volunteer car driver or someone who raises vital funding for one of our air ambulance charities, your work is immense and helps to save lives. “I would also like to pay tribute to the work of the Trusts Governors who help the organisation on an on-going basis. Thursday 1st June 2017 – 2.08pm – Murray MacGregor. Two teenagers have suffered serious injuries after being electrocuted. The incident happened at about 11.45am on parkland next to Durham Road in Wednesbury – a railway line runs down the other side of the parkland. An ambulance, a paramedic officer and the Midlands Air Ambulance from Cosford with a trauma doctor on board were sent to the scene. A West Midlands Ambulance Service spokesman said: “On arrival, ambulance staff found two boys on the parkland who had suffered serious injuries after being electrocuted. “Staff were told that four teenage boys had been playing next to the railway line. “The two injured, who are believed to be 13 years old, were taken to Birmingham Children’s Hospital, one by air ambulance, the other by land ambulance using blue lights. Thursday 1st June 2017 – 11.24am – Murray MacGregor. A motorcyclist has escaped serious injuries despite coming off his bike and ending up wedged under the front axle of a road sweeper. The incident happened just after a bend outside some agricultural buildings on Stone Road in Bramshall, Staffordshire at about 8.30am this morning. A rapid response vehicle was on scene in seven minutes of the 999 call and was backed up by an ambulance, a paramedic officer and the Midlands Air Ambulance from Staffordshire. A West Midlands Ambulance Service spokesman said: “On arrival, crews found the 45-year-old man under the front of the road sweeper. Fortunately, it had been sweeping at the time and was moving at a slow speed and was able to stop rapidly. The motorbike was in a hedge at the side of the road. “Firefighters used airbags to lift the road sweeper to allow ambulance staff access to the man.